Questions? We’re ready with answers! Simply click the question to see the answer. To view all, click “expand all.” And check out our handy print button, if you’d rather read them later. Don’t see the answer to your question here? Please contact us. What do I get when I sign up for a course today? We offer courses in a variety of subject areas—including English & Writing, Mathematics, Science, Government and Moot Court, Foreign Languages, Logic & Life Skills, SAT® preparation, Business, History, Economics, and Computer Skills. Access our course catalog pages here. The Academy offers 9 AP® courses. See a full course list here. “AP®”—which stands for “Advanced Placement®”—refers to high school courses taught at the college level. The courses prepare students for the College Board’s standardized AP® subject exams. The College Board approves the syllabus for each course that earns the AP® title, making sure that it covers specific content that meets guidelines for rigor and quality. AP® courses help students get ahead for college! First, many colleges will give credit on the basis of high AP® exam scores, or allow students to place out of introductory classes. Second, AP® courses show a high level of achievement that can give students an advantage in college admissions. Third, the in-depth content and coursework encountered in AP® courses help develop skills for college success. For more information about how AP® courses work, click here. What are AP® exams and how do they work? AP® exams are subject exams offered every May that correspond to the content and skills students learn in a specific AP® course. A high score on an AP® exam can qualify students to earn college credit at many colleges. You can read more about the exams on the College Board’s website. You may also like to take a look at our students’ past exam scores. Taking the AP® exam is not a requirement in any HSLDA Online Academy course, and some students choose not to take any exams. But we encourage students who have performed well in their courses to take advantage of the college credit opportunity the exams provide. AP® exams are taken in-person rather than online. HSLDA Online Academy does not issue or administer AP® exams. If you are a homeschooled student, or if you attend a school that doesn’t offer AP® testing, you can arrange to test at a local school. Test registration typically takes place between January and early March. During the spring semester, we’ll send your family reminders about AP® registration deadlines. Please note, AP® exams are only offered in May each year. Can I see a list of a course’s textbooks? Yes, you can view the required books for each course here. You can find information about books and materials on the course description page for each subject. If you wish to purchase textbooks, you can do so through the HSLDA Online Academy bookstore. If the book list indicates that it is for the 2019–20 academic year, then these titles have been finalized for the coming school year. If the book list refers to the 2018–19 academic year, you may use it to get a general idea of the books for the course, but should not purchase the books until an up-to-date list is available. Does HSLDA Online Academy issue a high school transcript? HSLDA Online Academy courses are offered “a la carte”—you choose the courses you want to incorporate into your overall high school program—so transcripts aren’t issued. For homeschooling families, it’s easy to add grades from your online courses to your own homeschool high school transcript. At the end of a course, we’ll send you an official statement of your student’s final grade, for your records. If you attend another school, or are part of a homeschool umbrella program that manages transcripts, ask your school about its transcript policy. We have worked with schools in the past to provide courses to their students, and most have been willing to incorporate online course grades into their students’ transcripts. However, each school has its own policy for accepting outside credit toward graduation requirements, so we encourage you to contact the school you’d like to transfer the credit to. If you would like help putting together your student's high school transcript, HSLDA members can contact our high school consultants for advice. Or, you can use the High School Transcript service, available through HSLDA's store. Are your courses NCAA approved? Yes, our core courses are NCAA approved. For a list of our approved courses, please visit the NCAA Eligibility Center and use HSLDA Online Academy's NCAA High School Code: 851368. Do you have dual credit courses? Yes! Our Pre-Calculus & Trigonometry course has been approved for equivalency with MAT 115 at Colorado Christian University. For reference, you can access our CCU Dual Credit Equivalency Sheet. If you are interested, please let us know at academy@hslda.org and see the CCU Dual Credit Flyer for details on how to sign up for Colorado Christian University's Dual Credit Program. Be sure to contact colleges or universities of interest to find out how the school will accept CCU transfer credits. Additionally, AP exam scores of 3 and above can count for credit at Patrick Henry College. Please see PHC's AP Equivalency Table for more information. How do the online courses work? Taking a course online provides flexibility for students with varied schedules. They can access instructional materials and complete weekly assignments when it fits around their other activities and commitments. The flexibly scheduled, independent work your student does online in a given week may include watching a lecture video, listening to an audio recording, reading posted documents, uploading an assignment, or taking a quiz. Though some online coursework is independent, HSLDA Online Academy courses are not simply independent studies. Students receive personal feedback from their instructors on assignments and can always contact them with questions. They have many opportunities to learn interactively with their instructors and fellow students in discussion forums, via email, and in live class sessions. In a face-to-face course, students often don’t get a chance to have the teacher repeat the material. Here, if your student’s teacher posts a video or audio lecture, it’s easy to go back and review. All of the weekly live class sessions are recorded, too—so if your student missed anything, or wants to learn it even better, the recording is available to go back to at any time. It’s ideal for your student’s learning—and for mastering the material. What is a live class session? In every HSLDA Online Academy course, students meet weekly with their instructor and classmates in an online classroom for additional teaching, discussion, Q&A, or group activities. The class sessions are interactive and are conducted using a web meeting software with video, audio, chat, and application-sharing capabilities. What if my student has to miss a scheduled class? All live class sessions are recorded for later viewing. While it is recommended that students attend each live class session, students can make arrangements with their instructors to watch the recordings and receive full participation credit. How easy is it to learn to navigate an online course? Does HSLDA Online Academy provide technical support? Certainly! When you sign up today, you can submit tickets to the Canvas Help Desk for any technical issues, as well as personal, as-needed help from the HSLDA Online Academy staff during business hours (9:00 a.m.–4:00 p.m., M–F). 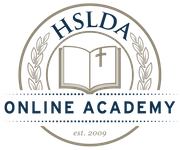 All HSLDA Online Academy instructors are Bible-believing Christians, committed to helping their students grow spiritually as well as academically. Most HSLDA Online Academy courses have two instructors—a Master Teacher and a Classroom Teacher. The Master Teacher is the visionary behind the course who personally designs and creates course content and oversees the progress of the course during the year. All are seasoned high school or college educators whose teaching is informed by a variety of academic and practical experiences in their respective fields. Each Classroom Teacher is a fully qualified instructor with a degree and specific knowledge that leads your student to success—and a heart to help your student individually improve and grow, while thriving in the online environment. The Classroom Teacher is the instructor that will run the live online class during each weekly meeting with your student. You can read about each of our instructors on this page. How much interaction will my student have with the teacher? Studying online doesn’t mean studying alone! Every week, the Classroom Teacher leads a live, interactive class session in a virtual classroom setting. Between sessions, the Classroom Teacher is available to answer questions via email or course message boards. The Classroom Teacher also grades your student’s work and provides assignment feedback to help your student improve. Can we contact the teacher with questions during the course? Absolutely! Classroom Teachers welcome questions from parents and students throughout the course. You’ll receive instructions on how to email the Classroom Teacher in the weeks immediately preceding the start of classes. If your question would be better addressed by the Master Teacher, Academy staff, or technical support, the Classroom Teacher will make sure it gets to the right person. Do the courses have age or grade-level requirements? HSLDA Online Academy courses are designed for high school students. Our high school courses are ideal for all high school students as well as 8th grade students. Our AP® courses are typically junior- or senior-level courses, though advanced sophomore students may also be ready to take them. Because you, as parents, are most familiar with your student’s abilities, you are in the best position to make decisions about course readiness—but we’re here to help you make an informed decision. General guidelines: A good place to start is our Academic Readiness page, which describes some characteristics of well-prepared students. Course-specific guidelines: We have course-specific entrance guidelines as well. Check our course lists for the specific course you’re interested in, then click on the name of the course. At the bottom of each course description page, read the information under the question, “Am I ready to take this course?” to help you make your decisions. Pretests: In some cases, the course instructor may provide a pretest, which will also be listed on the course description page if available. (Currently, a pretest is available only for AP® Calculus AB, Pre-Calculus & Trigonometry, and Algebra 2.) Your teen may take the pretest at any time, as the documents are self-scoring (you grade the test with the answer key provided). If your student does well on the pretest, then by all means, sign up. We’re happy to have you with us. Additional questions: If you have questions about whether our classes would be a good fit for your student, please feel free to call us at 540-338-8290, or email academy@hslda.org. What kind of students succeed at HSLDA Online Academy? Successful students are self-motivated and self-disciplined learners. They check their email and coursework regularly, complete assignments on time, actively participate in class discussions, and contact their instructor whenever they have questions. They work hard and have a strong desire to learn. Your student must also have a baseline of knowledge for the course material, have strong writing and reading skills, and be willing to commit time to their course (5–7 hours per week for high school courses, 8–10 hours per week for AP® courses). Do you provide accommodations for students with learning challenges or disabilities? The format of our courses allows for a lot of flexibility for students who have learning challenges or disabilities. For slow readers, timed tests can be set for longer test-taking times. Parents can read the text to the student. Online components can be viewed multiple times, as needed. For AP® courses, the College Board offers testing accommodations for the exams and our teachers can take these accommodations into consideration while prepping your student. If you’re a parent who has the time and dedication to help your student, we’re happy to work with you. We work with you and our teachers to find the right approach on a case-by-case basis, so please contact us to discuss the best options for your student by phone (540-338-8290) or email (academy@hslda.org). It only takes a few minutes to sign up online using our simple course registration form. If you have any questions while registering, please call 540-338-8290 (9:00 a.m. to 4:00 p.m. Eastern, M–F) or send an email to academy@hslda.org. I've already signed up for one course and want to add another. Is the registration process different? Yes—the registration process for returning students is a little different. So we don’t end up with duplicate accounts, students need to log in to their existing account to register for more courses. Use the Student Login Portal in the upper right corner to access your account. Once you’ve logged in, click on the “Enroll in an additional course” link. Signing up through your student account also ensures that you won’t be charged more than one registration fee in the same school year. When are the registration deadlines? Sign up by March 20, 2019, to save up to $200 per course. Registration for fall and yearlong courses closes on Wednesday, August 7, 2019. Fall and yearlong classes begin on Monday, August 19, 2019. Registration for AP® Macroeconomics courses closes on Thursday, January 2, 2020. AP® Macroeconomics begins on Monday, January 6, 2020. Registration for spring-only courses closes on Thursday, January 9, 2020. Spring-only classes begin on Monday, January 13, 2020. Please note that full payment is due at the time of registration. Remember—the course you want to take may fill up before the deadline, so register now to reserve your seat! For other important dates, please see the Academic Calendar. Tuition costs vary depending on the type of course you choose, the time of year when you register, and your HSLDA membership status. You’ll find a full breakdown of course costs on this page. I’m a member of HSLDA. What do I do to get my member savings? It’s easy. On the registration page, look for the field for your HSLDA member number. Simply place your 7-digit number in the field and your discount will be applied automatically. Note: You will need an active membership to receive the discounted member rate. If you are unsure whether your membership is active, you can call HSLDA Online Academy at 540-338-8290 to verify your membership status. You can renew your membership by phone or online. Visit this page to learn more about special pricing for HSLDA members. I'm not a member of HSLDA. How do I join to get member savings? You can join HSLDA online or call 540-338-5600 and ask for the HSLDA Membership Department. It can take two to three weeks to process your application and activate your member number. Membership applications submitted online typically take the least time to process. If you’re close to the course registration deadline and concerned about the timing, please call us at 540-338-8290. If my plans change after I register for a course, can I get a refund? If you need to drop a course, log into your student account and click “Drop this course” next to the name of the course you wish to drop. You will be eligible for a partial refund of course tuition up to the tenth business day of the semester when the course begins. After the tenth business day, no refunds are available. The $25 registration fee is non-refundable. Read HSLDA Online Academy’s full refund policy. We don’t offer financial aid or scholarships—but families facing financial challenges may be eligible for a HSLDA Compassion (formerly the Home School Foundation) grant. To contact HSLDA Compassion, click here. Payment is due in full to reserve your student’s seat in a course. Payment is made by credit card during the registration process. When do classes start and end? Please see our academic calendar. How do I log into my course? Immediately after you register, you’ll receive an email confirming your successful registration. Within the next few days, after we’ve processed your registration, you’ll receive a second email containing your username, password, and login instructions. If you have trouble logging in, please call 540-338-8290 or email academy@hslda.org. Your online courses will become available only when the semester starts. A Student Orientation Tutorial will be available a little before the start of the semester. If the “Access your online course” link in your student account doesn’t take you anywhere yet, don’t worry—we probably just haven’t activated it yet, because we’re busy getting the online campus fully set up for the new school year. If your class starts in less than a month and the link still isn’t working, please don’t hesitate to contact us. How do I order books for the course? You can order your books online through the HSLDA Online Academy bookstore. Books for each school year will be available starting in June. Please note: Your HSLDA Online Academy username and password will not work on the Christian Book Distributors website. You can either create an account with Christian Book Distributors or checkout as a guest. Do you have questions about ordering books? The bookstore can address your questions about new or used books, ordering and shipping, and returns. You can contact Christian Book Distributors at 1-800-247-4784. When will I hear from the teacher? The Classroom Teacher will send an email to all the students and parents in the class in the weeks immediately preceding the start of the course. Your Classroom Teacher’s email will include any course-specific instructions you need to begin well, and you’ll have the opportunity to ask any questions you may have before the course starts.